Even though Charles Darwin did not think highly of it (see quote below), the Galapagos land iguana is a text book example of evolution in action. The two species endemic to the islands are similar yet different. They resemble the mainland green iguana but are separate species. Likewise they are similar to the marine iguana, but do not usually interbreed. Scientists believe that the ancestral species colonized the islands from the mainland, and then evolved into the three species we see today (two land species and the marine iguana). 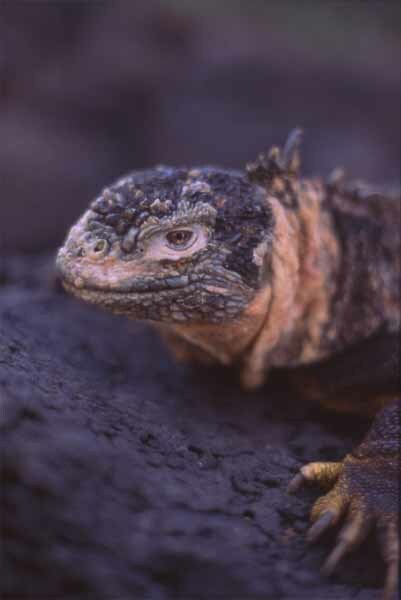 The Santa Fé land iguana (Conolophus palidus) is a separate species from the land iguana on other Galapagos islands. It is larger and has more muted coloring. The patchy camouflage type coloration has been likened to military fatigues. Another difference is the row of dorsal spines is more pronounced. 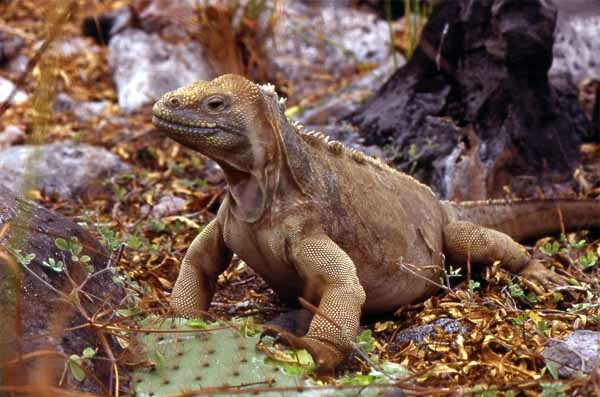 This especially large iguana pictured above is nicknamed "The General." He is eating a cactus pad that he knocked off a nearby giant cactus. This land iguana from South Plaza Island (east of Santa Cruz Island) is resting on black volcanic rock. This species is most widespread in the Galapagos, although there is some variation from island to island, which suggests the separate populations have diverged due to natural selection. "...they are ugly animals... they have a singularly stupid appearance"